Croly also knew what men did not want. 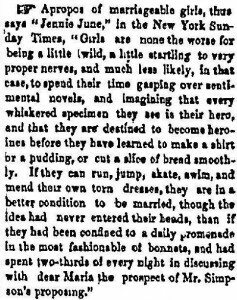 In 1868 the New York Press Club held a banquet to honor Charles Dickens, and Croly—a working reporter—asked to attend. She was informed it was a men's-only event. No women allowed. 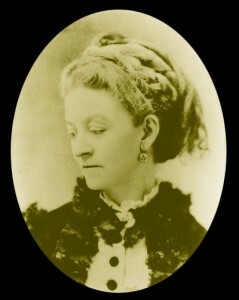 Croly responded by forming her own club, which she named Sorosis, and invited Dickens to speak at a breakfast affair. He declined. Nonetheless, Sorosis became a major forum “to promote agreeable and useful relations among women of literary and artistic tastes.” It was a place for women to discuss prevailing theories and issues of the day, and to consider their impact on future generations of women. It was also a great place to show off a new dress and to eat an extra-large lunch. Croly’s women’s club idea took off across the country to the extent that she later established the General Federation of Women’s Clubs and the New York Women's Press Club. Jane Cunningham Croly believed that the noblest job for a woman was to serve her family. And, what exactly did Croly suggest was a woman’s best preparation to become a happy and successful homemaker? Such a woman comes from a girl who has been allowed to run “wild” and is also expected to mend her own dress. Success will naturally transpire for a “marriageable girl” who has spent her time becoming fluent in her day-to-day skills, rather than one who has wasted her time dreaming about her knight in shining armor.